I will admit that I put off reading this novel until I just could not avoid it any longer, since it is at the top of many of the Newbery contender lists out there. The problem is that it is the sequel to One Crazy Summer, a book that made me very, very angry. I just wasn’t sure that I could handle that much negative emotion again, but I decided that I had to give it a try. Oh, it made me furious. But then it was so good. Here’s the setup. In One Crazy Summer, eleven-year-old Delphine and her two younger sisters, Vonetta and Fern, are sent to spend the summer with their mother, née Cecile but now styling herself Nzila, in San Francisco. Not that she wanted them—now or when she gave birth to them, but the girls’ father thought that it would be a good idea for them to get to know their mother. Cecile had abandoned them in order to become a Poet to the People and work as a part of the Revolution. When the girls arrive, she gives them food money—grudgingly—and leaves them to themselves. They hang out at the People’s Center each day with the Black Panthers. No thanks to Cecile, who is incredibly full of herself, they are not kidnapped or killed, and they escape starvation. Delphine has been forced to be a mother to her sisters since they were born, even though their grandmother, Big Ma, lives with them in Brooklyn, and she manages to get them safely through the summer in California. In P.S. 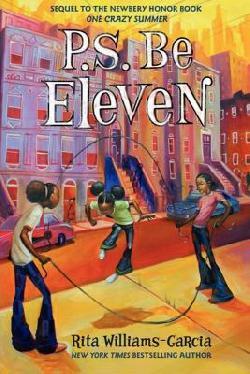 Be Eleven, the girls have just arrived back in New York and their house in the Bedford-Stuyvesant neighborhood in Brooklyn. Their father has taken the opportunity, while his daughters were away, to woo and win the hand of Miss Marva Hendrix. When Delphine writes to her mother to tell her how she feels about that, Cecile writes back that these matters are for grown-ups, and she puts the post-script, “P.S. Be eleven.” I almost threw the book across the room. What she was saying, to me, was, “Now that I don’t need you to act like the thirty-something, responsible adult that I’m supposed to be, and you are safely a full continent away and therefore not in my life anymore, act like a child.” Delphine was regularly beaten for her sisters’ bad behavior, since she was supposed to be in charge. Vonetta and Fern were intolerable, with a sing-songy parroting that was tiresome by page two, and completely out of control in public. Big Ma was the ruler of the house, and their father was a total wimp. The only character I liked was Delphine, but she was a gem. About a third of the way through, the book takes a turn, beginning about the time that they get a letter from the army saying that their Uncle Darrell was coming home from the war in Vietnam. Just like that, my heart was engaged. I remember those days. No one who is too young to remember the Vietnam War can understand what it is like to have all of the boys you know being drafted into a war with thousands of casualties broadcast on the news every night. My brother was drafted just before we moved from Georgia to New Jersey, and we were not there when he left. I thought my mother would die of sorrow. He made it through, but so many did not. When Big Ma welcomed her younger son home, I wept. There were other subplots that resonated with me, as well. The girls see the Jackson Five for the first time on TV, and they go wild. Michael Jackson and I were born the same year, and I remember the girls I babysat for being crazy about him and his brothers. In politics, Shirley Chisolm runs for Congress—and wins. She is the first African-American woman to be elected to Congress, and later becomes the first major-party African-American candidate for president. Even Delphine’s very kind father does not think that it is right for a woman to be involved in politics. I remember my own father saying much the same thing. Sometimes we forget how recently these battles were fought. There are drug problems, speeches from Bobby Kennedy, phonograph needles, and arguments over whether girls should ever wear pants. Such a blast from the past. I was six years old before I saw a girl wearing pants, and she was the daughter of my parents’ friends from New England. Southern girls wore starched cotton dresses, even for play. In the end, I realized that a writer who could elicit that much emotion, even if it’s not the reaction she intended— or maybe it was—is a superb craftswoman. I think part of my hesitation is due to the fact that I can’t tell how Rita Williams-Garcia feels about Cecile. Perhaps if I could discern some disapproval, I could jump on the bandwagon for this book. On the other hand, a writer who does not reveal her hand in her creation is skillful, indeed. Delphine develops so much maturity in these few months, as does Vonetta, and even their father grows a bit of a spine. Changes take place, and the ending is not neat and tidy, as so many children’s books would have it. I still cannot get past Cecile’s abandonment of her children, and I still do not care for many of the other characters, but Delphine is worth it. She is beautifully written. Not my favorite, but I’m glad I read it. If it wins, I can at least agree that it really is distinguished. Disclaimer: I read a library copy of this book. Opinions are solely my own and do not reflect those of my employer or anyone else.